Even before you start reading this, I want to put in a disclaimer - Though, the aim of the entry is to explore the meaning of the song 'Meenakshi Me Mudam Dehi', there is indeed an overdose of Philosophy here. There might be better places in the web if you want to quickly get the meaning of this carnatic composition. I dabble in a lot of religion and philosophy. In case that is something you don't enjoy, please skip the parts of this entry which are in italics. Meenakshi Me Mudam Dehi is a BRILLIANT composition by Sri Muthuswamy Dikshitar, one of the best composers in Carnatic Music, and a radiant member of the Carnatic Trinity. This song is one of the Crowning Jewels of Sri Dikshitar's creation - This might be the reason why he chose to give up his mortal coils after singing this song. He was indeed a Maha Yogi who knew the time of his death. His Holiness, Sri Shankaracharya, Sri Vijayendra Sarasawati of Sri Kanchi Mutt in a discourse said that, Lord Vishnu, in His Varaha Avatar had to go in Search of Vedas that were hidden, and reveal it to the world. However, what is that Vedas themselves are in search of? They are in search of the Grace of Sri Meenakshi! Oh Meenakshi, give (dehi) me (me) Bliss (mudam)! "Sukham me'syat" declares the Vedas. Everyone is in search of happiness either consciously or subconsciously. No one wants pain. Everyone wants happiness. Every action of a person is either for happiness or to avoid pain. Absolutely, no one wants pain / suffering. Is it possible to get only Bliss? Is there a state when one feels no sorrow? Who can bestow that state? The only person who can Grant the state is Meenakshi. Is there a reason why one has to give veiled requests to ones own Mother? So, Dikshitar, directly demands Meenakshi, to give Him the eternal Bliss. People who delve in Indian Vedic Philosophy will know of the classic 'Triputi' - The actor, action, object. For e.g, in Nirvana Shatakam  Sri Adi Sankara says - 'aham bhojanam naiva bhojyam na bhokta' - i.e. I am not object of enjoyment, nor the act of enjoyment nor the one who enjoys. 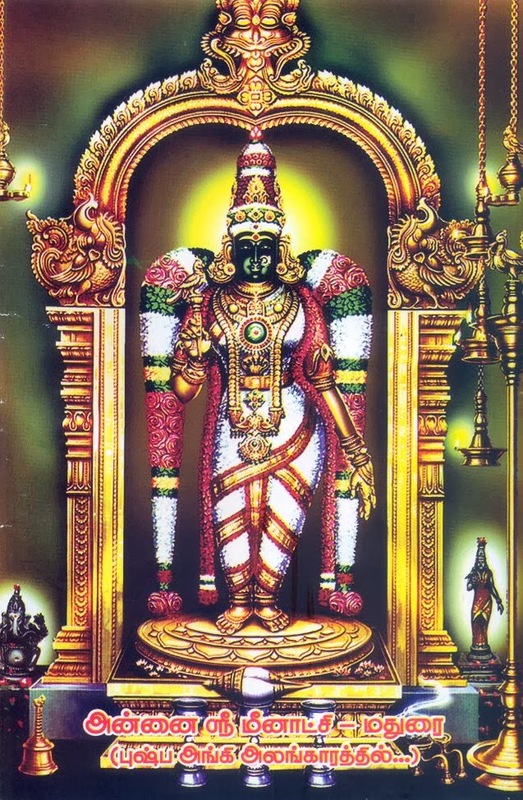 Sri Meenakshi is supposed to have a greenish hue - In fact all pictures of Meenakshi show her in a Green dress and She herself is of Green color. I want to recollect an incident here - One of my friends is an intense Matangi worshipper. He once got a note on some other Form to perform a particular worship. The first day he began his new worship (upasana) to the other deity, the same night a Lady in Green dress came in his dream and said 'Why do you have to perform other ways of worship while I am there?' - Needless to say, my friend didn't get into other ways of worship! She is the consort of Shiva, in the form of Sundereshwarar in Madurai. The Jaaya means wife / consort. So,she is the Consort of Shiva. Sri Muthuswamy Dikshitar seems to lose Himself in the beauty of the Goddess, just like Sri Sankara's heart melted when He meditated on the Form of the Goddess and Saundarya Lahari poured out. The ultimate reality is One. Rig Veda proudly asserts 'Ekam Sat Vipraha Bahuda Vadanti' - Truth is One, but Learned describe it in many ways. Though the Supreme Reality is One, it expresses itself in various forms. Why? The ONLY reason why the Supreme Goddess expresses Herself in various Forms is to thrill Her devotees and plunge them in final ecstasy of union with divine. Sri Meenakshi is the Supreme One, exists only to enchant Her devotees. Her devotees finally lose themselves in Her Grace and Beauty and finally cannot think of anything but Her. When this Bond with Goddess is so strong, all other bonds slowly lose their strength, and for the devotee, only Goddess and bond with Her remains. All other bonds with material goods and other relations are cut. 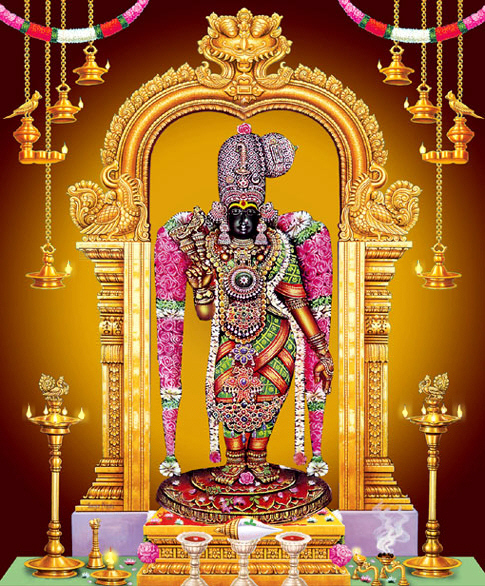 The word Shivam means the most 'Auspicious' - Indeed Goddess Meenakshi is the Most auspicious One and hence the hallowed soul, Sri Muthuswamy Dikshitar merged into Her. In the first line he starts demanding (not requesting) Meenakshi to give him the Supreme Bliss - Indeed, Goddess gave him that when She took him to Her when he gave up his life. Just the pallavi and anupallavi have taken so much space :-) - I'll share my commentary on the Charanam in Part 2. I hope it doesn't come out 2 years later! (3) Actually, I haven't completed the anu pallavi :-) - Only half of it is complete. Will complete it this week.